Stay connected to Chesapeake Bible College after graduation is a great way to keep the relationships built during your college years alive and well! With 40 years service in Higher Biblical Education, we have quite an active Chesapeake Bible Alumni Association and we invite you to connect with us! Here’s our Calendar of upcoming Chesapeake Bible College events providing our alumni with great opportunities for fellowship – all while continuing to learn and connect with one another. We appreciate the opportunity to ensure that you receive the latest news and information about upcoming events! As an Alumni and/or friend of the Bible College, we want you to be the first to know! Update us with your contact information by clicking the link below. The CBCS Alive! News Magazine is a regular publication of the Chesapeake Bible College & Seminar for students, alumni and friends of Chesapeake Bible College. Download your copy by clicking the link below. Chesapeake Bible College & Seminary is committed to developing an online experience that is cutting edge and making good use of the up-to-date technology – including tablet and mobile technologies. To keep our students, alumni and friends connected with our fast-paced development efforts, we’ve added our CBCS Alive! TV programs. You will find our most recent videos featuring interviews with professors, students, administration, etc. discussing new and exciting topics affecting our world and how Chesapeake Bible College is working to promote the Kingdom of God here on earth. Contact our Production Team at CBCS at MultiMedia@ChesapeakeBibleCollege.com, with your suggestions and/or ideas to help us spotlight news and information of value and/or the something (or someone!) connected with Chesapeake Bible College that is making a difference for the Kingdom! 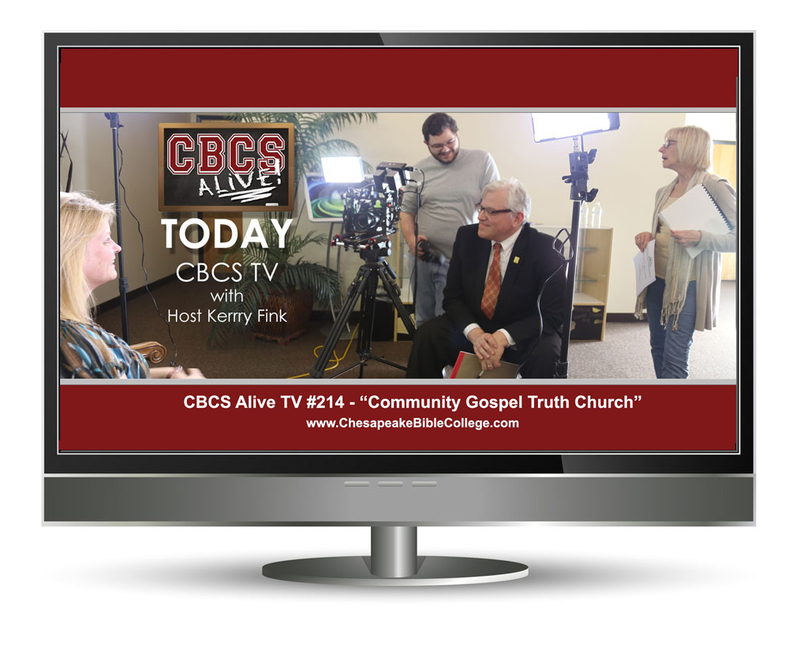 Subscribe to Chesapeake Bible College & Seminary On Demand Channel at YouTube. Connect with Chesapeake Bible College & Seminary on Linkedin. We’re excited about the great technologies that allow us to stay connected worldwide. Linkedin is a valuable resource for career and business professionals (i.e. students and alumni) to network, get resources and support while building relationships with potential customers, clients and partners. Connect now! Connect with Chesapeake Bible College and Seminary on Facebook! It’s a great way, also, to connect – or reconnect – with fellow alumni and find out what they are up to. The Chesapeake Bible College Alumni Facebook page is a great place to find news, updates, and socialize with current students and fellow alumni. Like Us on Facebook and begin sharing old memories and making new ones with the wonderful people associated with Chesapeake Bible College.